I attended the Isabella County Master Gardener conference and met up with a friend, Peppermint Jim. Peppermint Jim shared his story of how his family almost lost their mint farm located in St. Johns, Michigan, one of the few mint farm distilleries in the U.S. operating since 1912. His talk was followed by his friend Chef Nick who made a few salads using mint, my favorite being the fresh sliced cucumbers drenched in a sour cream, yogurt and mint dressing. Delicious! I was, however, somewhat disappointed since it was after lunch and I was really looking forward to some dessert. So, I made my way to talk to both of them after their presentation and buy some more mint oil. It was really nice catching up and meeting Chef Nick for the first time and suggesting the dessert idea for next time. After I bought a bottle of peppermint oil and a bottle of spearmint oil, I stopped at the grocery store to pick up a few things. It was meant to be. 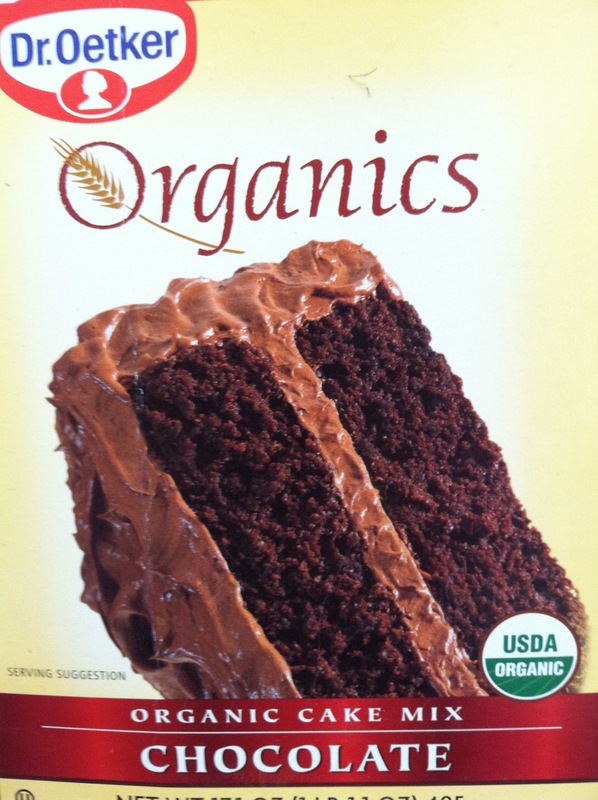 Up on the shelf in the isle with all of the baking supplies was Dr. Oetker’s Chocolate Cake Mix. On sale! So I grabbed it and headed home to make some cupcakes. On my drive I decided to make the chocolate cake, and then for the frosting, a simple buttercream frosting with a drop of peppermint. I didn’t even know if I could use the peppermint oil in my food but why not? It’s in gum right? Knowing a little goes a long way, I flavored the frosting with 1 drop of peppermint. 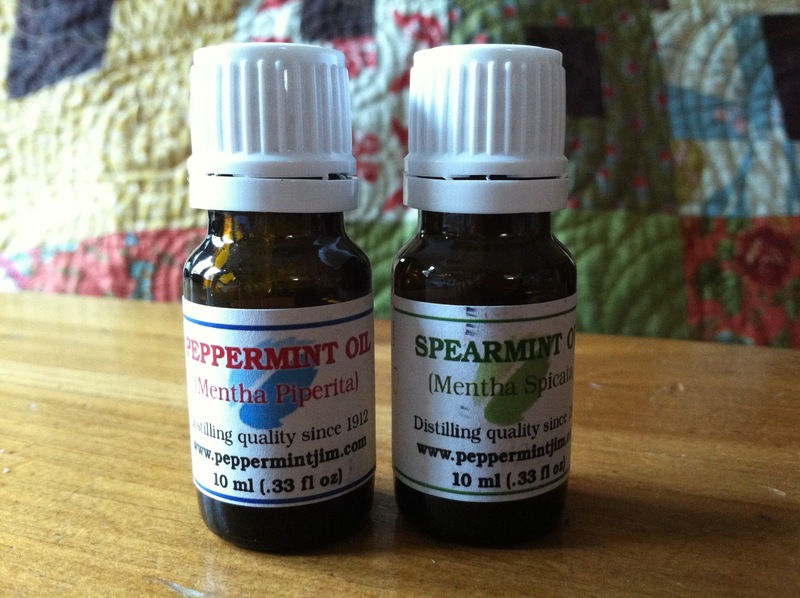 Wanting a little more flavor, I decided to use 1 drop of spearmint. Perfect! 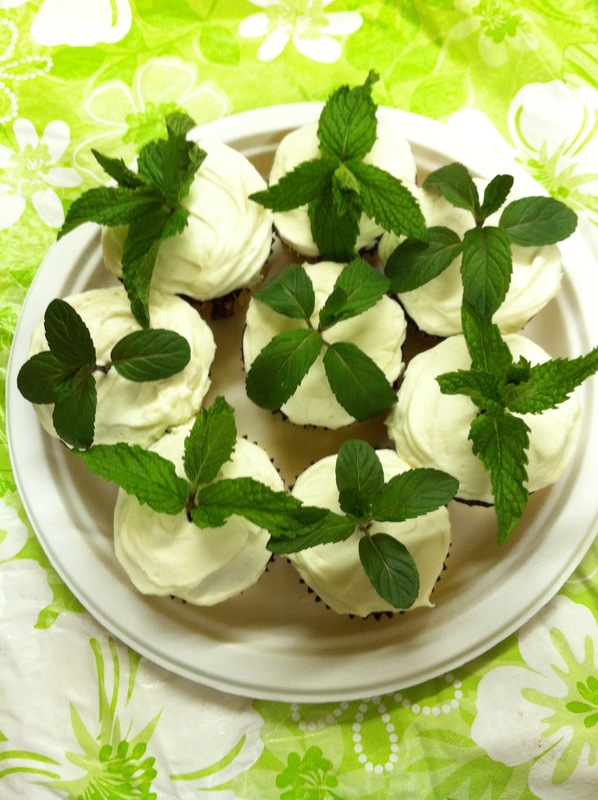 After frosting the cupcakes, I thought they looked a little boring, so I grabbed my scissors and went out to the garden and clipped about 3 inches off the tip of both a spearmint and peppermint plants. Back in the kitchen I used a toothpick to make a hole in the center of the cupcake, removed the lover leaves of the peppermint and stuck it in the hole I made with the toothpick. I am in LOVE! That sounds really good. Chef Nick made something similar using orzo instead of quinoa. The best time to harvest peppermint is just as it starts to flower. I will post a few recipes when I write about mints very soon. Good idea! Thanks Sara. I wonder how peppermint, chocolate, chocolate chip cookies would taste? Thanks for the idea Rachel!